ONE of Scotland’s biggest law firms is “joining forces” with one of Shetland’s leading solicitors and estate agents. 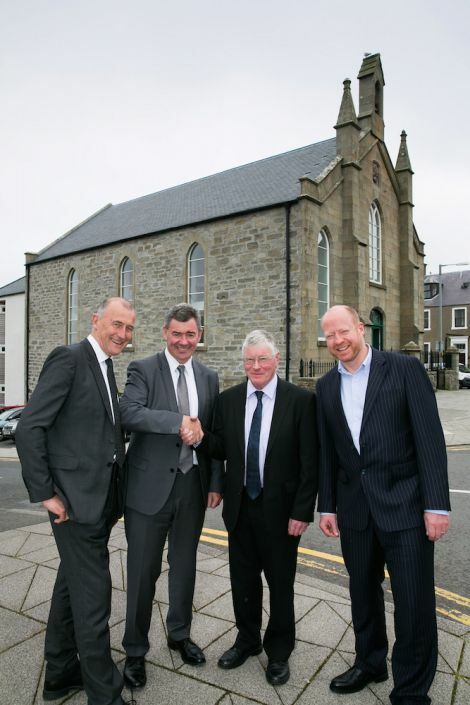 Dowle, Smith and Rutherford (DSR) at Lerwick’s St Olafs Hall will become the fifth office of Harper MacLeod from 1 October. DSR’s 12 staff, including partners Chris Dowle and Paul Rutherford will now go under the title Harper MacLeod incorporating Dowle, Smith and Rutherford. Harper Macleod already has offices in Inverness, Thurso, Glasgow and Edinburgh. Chairman Lorne Crerar said: “We are absolutely delighted to have this opportunity to establish a presence in Shetland. “We know Chris, Paul and the firm very well having worked closely with them for many years and I am thrilled to be welcoming them to the firm. “It’s a mutually beneficial move for both firms and will add the full range of Harper Macleod’s commercial and personal legal offerings to current and future clients. He said DSR will make a significant contribution to Harper Macleod’s turnover, which hit a £22.1 million in the past financial year. Rutherford said: “There has been a close bond between Dowle, Smith & Rutherford and Harper Macleod for many years and this integration is great news for our all of our clients and our people. “The most important factor for us is being able to deliver excellence of service to our clients. “Being part of such a successful business will give them access to a much greater range of expertise and strength in depth, while providing continuity of the service they have come to expect. Harper Macleod is already on the panel of law firms which provide support to Shetland Islands Council. Crerar added: “I’ve been a regular visitor to Shetland for years and know of the huge opportunities for its economy going forward. It’s also a fantastic place to live and work, and was recently named one of the best places in the UK to raise a family. “We are already the leading full service legal brand across the Highlands and Islands, with offices in Inverness and Thurso, and have never been afraid to go where we see an opportunity. “We have built a sustainable legal business at a time when other models clearly aren’t succeeding. “The islands’ role in industries including oil & gas, renewables, engineering and aquaculture, along with its strong export base, make it an extremely attractive place to do business. “Shetland is also one of the most prosperous parts of the Highlands and Islands, with high home ownership and employment levels and a growing population requiring personal legal services. The move comes shortly after Harper Macleod announced the addition of five new partners among 10 recruits to its Edinburgh office following the administration of rival law firm McClure Naismith. Together, the moves represent growth of around 10 per cent overall for the firm, while its overall headcount is now approaching 400. Harper MacLeod were legal advisers to the Glasgow Commonwealth Games and were voted Law Firm of the Year last year.